If I was offered the chance to meet with any chemist from history it would have to be young Henry Moseley, who lived from 1887 to 1915. Moseley was undoubtedly a genius, but was tragically killed in the first world war, and if I could go back in time I would have added my concerns to those of his family and senior research colleagues by pointing out to him that there were ways of securing a British victory other than joining up as a front-line soldier. Had he offered up his undoubted scientific talents to support the war effort as a ‘back-room boffin’, he would have avoided the sniper’s bullet in the ill-conceived Dardanelles campaign of 1915. He was killed during the Battle of Gallipoli on 10 August 1915, aged only 27. 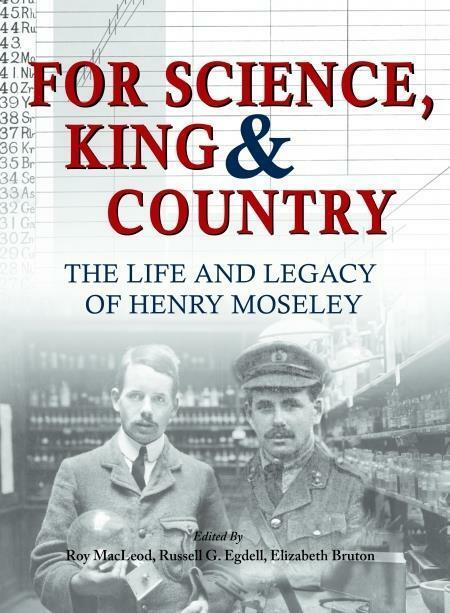 This book is the most comprehensive yet written about Moseley, his life and what accrued from it. We learn about his family, schooling, university experiences, his time with Ernest Rutherford at Manchester, his brief return to Oxford to further his pioneering research on the x-ray spectroscopy of the elements and finally the manner of his fruitless, tragic death. We do not learn anything about romantic entanglements. Perhaps there were none. He comes across as a thoroughly likable, principled young man, as evidenced by his decision not to take all the credit for the concept of atomic numbers, a reality that Moseley confirmed through his spectra and their analysis. Instead, he acknowledges the speculations of Dutch lawyer Antonius van den Broek as the inspiration that determined the direction of his research. The second half of the book concerns Moseley and his work post-1915. His failure to win a posthumous Nobel prize is debated (possibly this was due to political machinations: Sweden had a significant pro-German aristocracy at the time). We have accounts of the subsequent searches for the ‘missing’ elements that he deduced from the gaps in his plots of wavelength against atomic number, and we have descriptions of modern derivatives of his spectroscopy and their applications. For Science, King & Country is astonishingly well researched and referenced. Moving, too, when it comes to the descriptions of Moseley’s death. For those interested in the history of chemistry I would thoroughly recommend it.